The Xillor Archivist is a collection of PHP scripts that archives data from the web-based game Hyperiums ("Xillor" is one of the game's alien races). It can download game data files (gzipped text), which provide a snapshot of the Hyperiums universe. It also lets you import this data into a MySQL database to aid in further analysis. 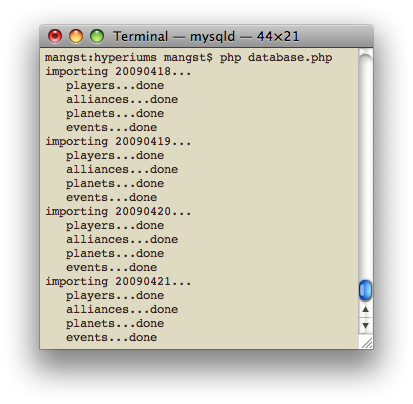 The database stores the histories of every alliance, player, and planet and also logs all in-game events. Follow the initial instructions found in the readme.txt file. If running Linux, you can use cron to run both these scripts on a regular basis.